Spring Fling is a springtime tradition in Spartanburg. For the most part, people know the hits. 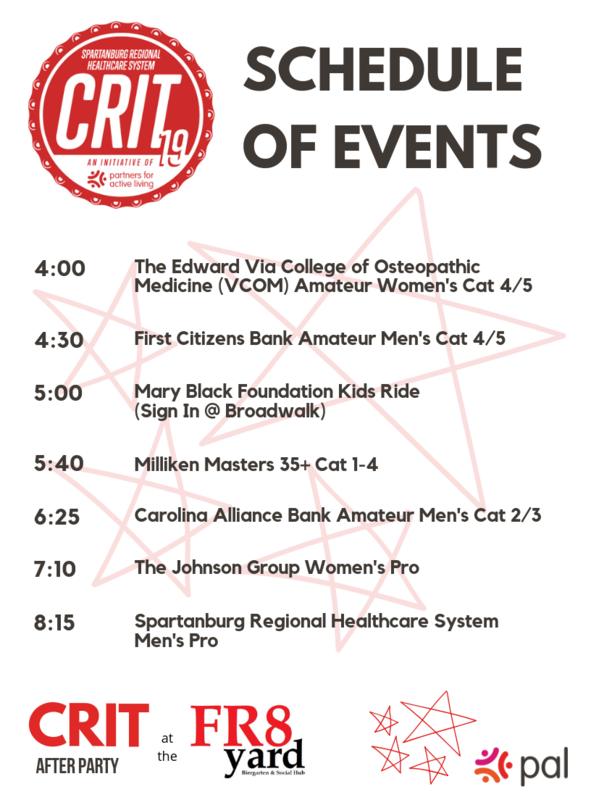 The fastest night in Spartanburg at the Spartanburg Regional Healthcare System Criterium. Local crafts and food vendors lining the streets offering unique, handmade products and delicious food to chow down on. Live music featuring some of the area’s best artists jamming under the spring sun. That’s not to say new ideas and attractions aren’t welcome, though. And this year’s Spring Fling features a few new attractions sure to appeal to many a Spring Fling-goer. The first new addition capitalizes on Spartanburg’s growth when it comes to craft beer. The Burg Biergarten, from noon-4 p.m. on the Saturday of Spring Fling, will feature each of Spartanburg’s five (yup, we said five) craft breweries. Ciclops Cyderi & Brewery, Holliday Brewing, New Groove, Plankowner Brewing and RJ Rockers will all be set up under a tent on the north end of Church Street near the newly-revitalized Montgomery Building. A ticket and samples from Spartanburg’s best brews is only $10. As if that wasn’t enough, a ticket giveaway for October’s Hub City Brew Fest is included. Each of the five breweries will have two samples each. If you want to try a little of everything, you can purchase two punch cards letting you sample every brew under the tent. Up next is a Food Truck Rodeo! And who doesn’t love food trucks? Expect to find some great eats at these food trucks, which will be lined up on East Main Street near Denny’s Plaza. Bullhded Peanut Co. – Bulllhded brings a modern twist to the classic snack of boiled peanuts, and is sure to be a favorite at Spring Fling. I mean, who wouldn’t want a cup of boiled peanuts walking around Downtown Spartanburg?? Cheap Eatz on Wheels – The Gaffney-based food truck, led by executive chef Alain Suissa, features gyros, grilled chicken and fried-up favorites like fish, chicken, hush puppies and more! Cheap Eatz on Wheels – Bringing barbecue classics to the streets, Cheap Eatz offers brisket, pork and chicken sandwiches with classic sides like fries, slaw and baked beans. SC Street Pops – Sparkle City Street Pops brings the sweet to sweet treats, offering gourmet gelato and sorbet pops. The Street Pops truck will have everything from chocolate and birthday cake to lemon and orange crème to green tea and caramel available as gelato pops and sorbets of strawberry, peach, mango and more! The Farmers Table – Popular Spartanburg restaurant The Farmer’s Table will have their food truck serving up their well-known dishes. Don’t be surprised to see delicious breakfast and lunch treats available no matter when you visit them! The Pound Cake Man – The Pound Cake Man’s truck features, well, pound cake! Popular options are the classic, chocolate chocolate chip, lemon and strawberry. You can find these food trucks between 10 a.m.-9 p.m. Saturday and from noon-6 p.m. on Sunday! This is for all our four-legged friends! The Sunday of Spring Fling will be dog-friendly for the first time ever! Vendors identified by a paw print will have special products available for your furry friends. Enjoy the sunshine and warm air with you dog by your side! If nothing else, walking around that much will get the dog some activity (and hopefully some sleep)! Spring Fling 2019 is set to be a big one, with these new additions adding to a world-class bike race, the area’s best food vendors, the showcase of locally-made products and musicians rocking the stage. And who knows, maybe in a couple of years the Burg Biergarten and Dog-Friendly Sunday will be just as big a part of Spring Fling as the Crit! Saturday, April 27, 10 a.m.-9 p.m.
Sunday, April 28, noon-6 p.m. The Spartanburg Regional Healthcare System Criterium, the opening of Spring Fling every year, will kick off at 4 p.m. on April 26. The full schedule of races, which run from 4-8:15 p.m., can be found here.